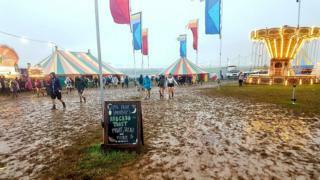 A music festival has been called off part way through due to safety concerns after heavy rain. Several acts at the Y Not event in Derbyshire had already been forced to cancel due to the conditions. Organisers said it had been an "incredibly difficult decision" but the state of the ground and stages had forced them to abandon Sunday's event. Fans on social media demanded refunds, which organisers have promised to provide "further information" about. The news was announced via a statement on the festival website. Event director John Drape said he was "gutted" at what had happened. "We have meetings every six hours to discuss things like weather conditions and ground conditions. "On Saturday night it became increasingly clear conditions were deteriorating and at midnight there was not one agency which felt it was safe to continue." Mr Drape denied festival organisers had been caught out, saying they had spent 30% more on infrastructure and had brought in 80 tonnes of woodchip to stabilise tracks. Heavy rain and wind on Friday night turned much of the site near Matlock to mud and stopped headliners The Vaccines performing. In a tweet, the band said they were "sorry sorry sorry" they could not take to the stage. The sold-out event had seen performances by Stereophonics and Jake Bugg rearranged, with some acts playing under gazebos on stage to stay dry. More rain overnight on Saturday made the site increasingly hazardous. Fan Ellie tweeted: "Paying £140+ to watch ONE act, kill your legs & be dripping in mud; probably returning with pneumonia, is not my ideal weekend." Festival-goers have been advised to leave and special arrangements have been made to get vehicles out of the car park. However, provision has been made for those who cannot leave until Monday. Traffic congestion was reported around the site, with police having closed off some roads to through traffic. Drivers were being asked to avoid the area. Y Not Festival marks 10 years since "overspilled house party"